Background: The literature shows that a healthy diet, rich in fruits and vegetables, has positive effects on overall cardiovascular risk, protecting against atherosclerosis. Design: A cross sectional study in a population of apparently healthy young-adult men with the aim of investigating dietary determinants of early atherosclerosis, assessed by measuring carotid intima-media thickness (cIMT) and flow-mediated dilation (FMD) of the brachial artery. Methods: 615 males (mean age ± SD: 40.8±9.8 years) without overt atherosclerosis were evaluated. Dietary intake was quantified by the European Prospective Investigation into Cancer and Nutrition (EPIC) questionnaire. Intake of antioxidants was expressed in relation to total caloric intake. Results: Neither absolute, recommended daily allowance or weight-related values of nutritional intake variables were associated with cIMT. Vitamin E to total calories intake (odds ratio, OR=0.08, 95%CI=0.03-0.89) was inversely associated with impaired FMD. 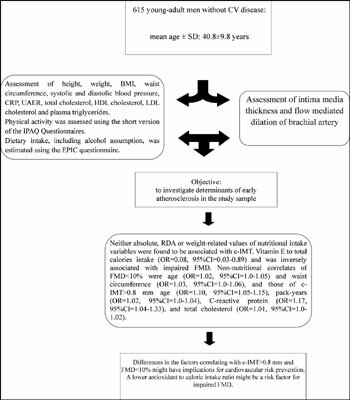 Non-nutritional correlates of FMD <10% were: age (OR=1.02, 95%CI=1.0-1.05) and waist circumference (OR=1.03, 95%CI=1.0-1.06), and those of cIMT >0.8 mm were age (OR=1.10, 95%CI=1.05-1.15), pack-years (OR=1.02, 95%CI=1.0-1.04), C-reactive protein (OR=1.17, 95%CI=1.04-1.33) and total cholesterol (OR=1.01, 95%CI=1.0-1.02). Conclusion: Differences in the factors correlating with cIMT >0.8 mm and FMD <10% might have implications for cardiovascular risk reduction. A lower antioxidant to caloric intake ratio might be a risk factor for impaired FMD. Keywords: Diet, antioxidants, carotid intima-media thickness, flow-mediated dilation, young-adult, atherosclerosis. Keywords:Diet, antioxidants, carotid intima-media thickness, flow-mediated dilation, young-adult, atherosclerosis. Abstract:Background: The literature shows that a healthy diet, rich in fruits and vegetables, has positive effects on overall cardiovascular risk, protecting against atherosclerosis.